Many companies are using Custom Point of Sale Displays (POS) to increase brand awareness and maximise revenue. However, we notice that a fair share of brands in the market did not opt to use this marketing tool. Why? Below is a Custom POS Display example by the brand Hokkaido Baked Cheese Tart. 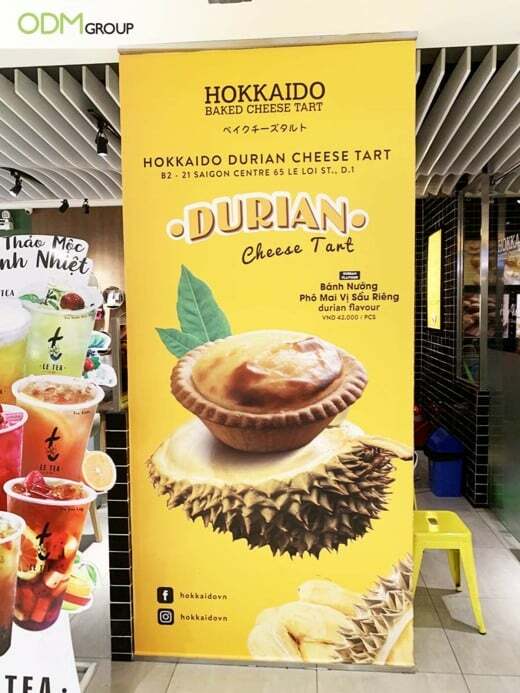 The brand is currently promoting their durian cheese tart and they did a great job of presenting their product in a visually enticing manner. For those not in the know, Durian is a fruit that grows primarily in South and Southeast Asia. It gives off a pungent smell so even if tastes good, it repels first-time eaters. However, their display gives this foul-smelling fruit a new face. Passersby will be curious to know how it tastes or whether it smells. Furthermore, they took this opportunity to expand their online reach by printing their social media sites on the tarpaulin. This way, customers can take a photo of their purchase and share their experience eating this delectable treat online. That’s how effective their POS display is! So, are you looking to use custom point of sale displays to augment your in-store marketing? Below we discussed the benefits of using this marketing tool. There are endless opportunities to showcase your products or promotions. The use of iPads, lights, acrylic, etc. You can also explore different styles and colours. The possibilities are endless! More brands are using Interactive point of sale displays to augment their brand activation campaigns and enhance customers shopping experience now more than ever. So why not customize your POS display to include interactive media and keep people coming to your shop or stall? Customising your Point of Sale Displays can allow you to successfully express your brand message. Including interesting slogans or quotes will let your consumers know what your store is about. Custom Point of Sale Displays can include crucial information such as current promotions and customer loyalty programmes, etc. You can also highlight the main selling product or a newly released item from your store. Adding your social media sites can also help improve your online presence. Higher store visits and lead to a higher chance of purchase rates. Customers might be enticed to purchase after seeing the possible discounts or benefits of the newly released products. This will increase sales because a great POS Display can lead to first time purchases, repurchases and drive impulse purchases. You can build rapport with your consumers and provide a positive experience by engaging with them. To do so, you can add quick response bar codes / QR codes for customers to scan. This QR code can lead them to your website where they can participate in ongoing online contests or survey. With a survey, you can get feedback to improve your services. You can also easily obtain potential buyers contact details so that you can send them marketing emails. To further engage them, a social media competition could be hosted. Not enough retail staff? Fear not! A good Point of Sale Displays can be an effective way to communicate the message to your consumers even without the assistance of sales people. This way, your sales associates can focus on more important aspects of the business. POS Display helps them with their job when your retail staffs are busy. 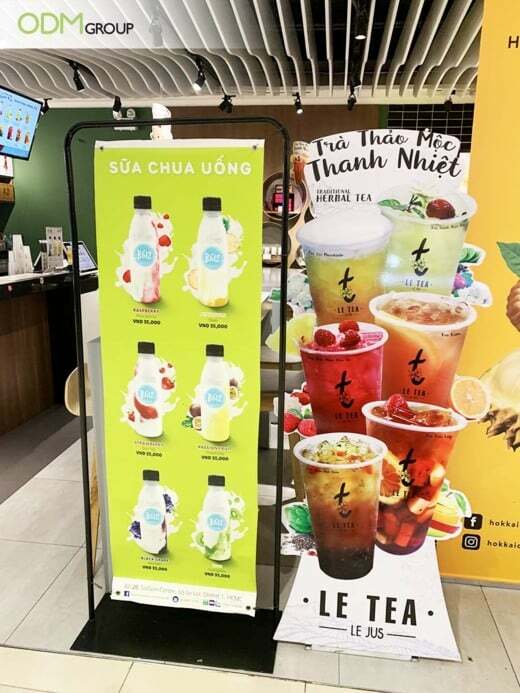 Here, you’ll see that Le Tea and another tea brand have also set up their own POS standee to promote their line of herbal teas. The colorful graphics, which look summery and refreshing, suit the products very well. If not careful enough, the message and designs of your Custom Point of Sale Display might come across as offensive. The design and marketing team should always consider the audience when producing the promotional display. This could lead to existing customers to walk away, or for the public to boycott your brand. There are many affordable options when it comes to making Custom Point of Sale Displays and in-store displays. However, if companies opt for an elaborate and bespoke POS Display, it might be costly. Some brands would prefer to invest in a powerful and impactful display to better catch consumers’ attention. However, it might be cost-effective for the company if the display can be used long-term. for short promotional runs, a corrugated cardboard POS display would be a good option. Keen in making your very own Custom Point of Sale Displays? Feel free to Contact ODM today to find out more! Our experienced designers will be able to provide you a unique and outstanding design to wow your audience. The team will be able to ensure a pleasant experience and a satisfied result. Aside from, POS displays, we can also help design and manufacture custom promotional products and product packaging. Interested in more examples of POS Displays? Check out our other blogs! Find out how to pair innovation and success to produce a POS Display to maximise sales and increase brand awareness. Soda Stream has a great POS display idea with tangible benefits! Find out how to make a successful Custom Cosmetic POS Display. Here are 3 Factors That Make a Great Custom Cosmetic POS Display!